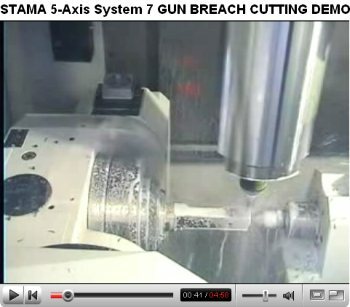 Here’s a remarkable video clip demonstrating state-of-the art CNC production of precision gun parts. In the video, created by STAMA America, an HK pistol gun breech is crafted from bar stock through a totally automated drilling/milling procedure. The breech is made by STAMA’s Model MC 726 MT, a unique five-axis, CNC milling/turning center. The five-axis machine is designed for continuous production of complex parts from bar stock and multiple different parts, including weapon components. The process shown in the 5-minute video actually takes 50 minutes to craft the breech, starting with a 60mm diameter section of 42 CrMo 4 steel. Amazingly, the 5-axis machine employs 25 separate tools in the operation! Share the post "Amazing 5-Axis Automated CNC Milling"